I am interested in the interplay between abiotic and biotic factors that structure communities along elevational gradients. Somewhat because I love mountains, I grew up with them, and the idea of hiking up and down every day sounds like something I could do for a career. More importantly because as I hike, I see changes that I want to describe. Alpine areas are some of the most inhospitable environments on earth, but as a consequence they are under a number of unique constraints that we do not yet fully understand. They are also incredibly useful systems with which to examine changes in community structure and function across a relatively small spatial extent. Using elevational gradients I attempt to combine novel approaches that have been developed in the field of community ecology. Community phylogenetics allows us a look at not just what number of species exists in an area, but the evolutionary relationships between these species. Concurrently, functional ecology has explored using standardized functional 'traits', or characteristics, which we can use to examine the structure of a community. Both these measures try to describe the function of a species in its environment, and as such how a combination of biotic interactions and environment selects for species within the community. Stemming from my interests in understudied taxa, one of my projects involves a collaboration with Dr. Hans Cornelissen and Dr. Nadia Souzilovskaia at the Vrije Universiteit, Amsterdam, where I worked with a team attempting to describe novel functional traits in bryophyte species. Understanding how species will adapt to change is essential to predicting the effects of climate change in arctic regions. In particular, areas of thaw in permafrost regions, or thermokarst, are becoming more and more prevalent in the high arctic. 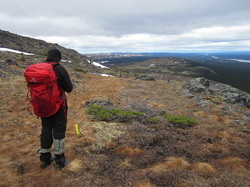 In collaboration with Michael Becker and Dr. Wayne Pollard, I collected data on vascular plant phenology, or the timing of leafing and flowering, for a study site on the Fosheim Peninsula of Ellesmere Island, Nunavut, summer 2013. This study will examine differences in phenology between thermokarst and undisturbed areas of polar desert, using temperature and ground ice data, as well as incorporating phylogenetic information. There has been a growing interest in resource extraction in the arctic, particularly due to the recent opening of the Northwest Passage. However, the arctic is slow to recover to any disturbance, and this can have huge implications for the recovery of impacted ecosystems. With an undergraduate student in Dr. Jonathan Davies lab, Stephanie Schooner (now MSc candidate), we are examining a chronosequence of vegetation recovery among mine sites. We aim to evaluate patterns of natural recovery using both a local and regional species pool framework to ask the question of whether site-specific assessments should take into account available nearby flora, which will have a greater chance of establishment due to dispersal, during ecosystem management studies. This research is based on a recent collaboration between Stephanie Schooner, Dr. Daya Dayanandum and Dr. Jonathan Davies, and explores community assembly along an elevational gradient in the Eastern Himalayas (Arunachal Pradesh). This area is dominated by extensive land use along mountain slopes, but also harbors a unique set of plant taxa native to the region. Our research aims to a) classify phylogenetic patterns across the gradient and b) link both phylogeny and functional traits to land use intensity. This research will be conducted over the course of 2013-2014.